The Sonos AirPlay 2 update is out, and if you’ve always wanted your iPhone, iPad, and Macs to play more with your Sonos speakers, this may well scratch that itch. Though the AirPlay 2 support isn’t limited to Sonos, the speaker-maker’s streaming system is one of the best known, and its integration one of the more polished. Read on for how to get started, how to use AirPlay 2 on Sonos, and what else you need to know. So what’s new in AirPlay 2? AirPlay is Apple’s media streaming protocol, which allows audio and video to be wirelessly distributed between iOS and macOS devices including iPhone, Apple TV, and HomePod. At first, Apple kept all that streaming to itself, though there have been a few third-party apps that have tried to squeeze other devices into the action. With AirPlay 2, however, it’s getting official third-party support. What that means is native streaming, from iOS and macOS devices, to a compatible third-party speaker. It’s not just Sonos: models from numerous manufacturers, including Bang & Olufsen, Yamaha, and more, are getting updates to support AirPlay 2. If you listen to Apple Music on your iPhone, for instance, you can now hit the AirPlay button in the app and choose one of your Sonos speakers to pick up the playback. However, AirPlay 2 also supports grouped speakers. If you have several Sonos speakers set up in a single room, or link every speaker in the whole house into one zone, you can stream via AirPlay 2 to them all simultaneously. It’s not just music, either: gameplay and video audio should support it, too. 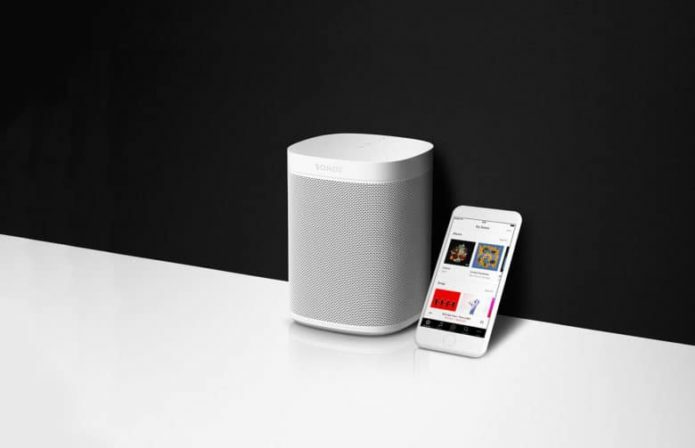 Sonos’ four most recent models have native AirPlay 2 support. That means the Sonos One, Playbase, Play:5, and the new Beam soundbar. Each has the networking and processing capacity to run the update. Once the latest software, with AirPlay 2 support, has been installed, you should see them in the list of AirPlay options on your iOS or macOS device. But I have older Sonos speakers, are they junk now? Sonos has a reputation for lengthy product support, and even its oldest products still work with many of its newest features. Wisely, then, there’s still a way to get AirPlay 2 working with speakers released prior to the Play:5. It just requires a workaround, since they’re not powerful enough for standalone, native support. Instead, Sonos takes advantage of its own grouping technology. While you can’t stream over AirPlay 2 from your iPhone X to, say, a Play:1 or a Playbar directly, you can group those speakers with one of the four natively compatible models. That way, anything which streams to a Sonos One, Playbase, Play:5, or Beam can also be heard on any other Sonos speaker it’s grouped with. It’s a solid workaround, though it does mean that if you want to have AirPlay 2 support in every room you have Sonos speakers, you’ll also need to have one of those four models in that room too. That could get expensive if you haven’t already upgraded recently. Still, it’s a lot cheaper than replacing whole zones-worth of speakers completely. Does this mean Siri on the Sonos One and Sonos Beam? Not quite. Sonos is still following its assistant agnostic path to smart speaker nirvana, though for the moment only Amazon’s Alexa is baked into the Sonos One and the even newer Beam. The Google Assistant is on the roadmap – the company still maintains it should be arriving as an update sometime in 2018 – but there’s no sign of Siri actually residing inside a Sonos speaker. Instead, there’s the next best thing. If you have an iOS device, like an iPhone or an iPad, you can integrate Siri on that with your Sonos speakers for voice control, building on top of the AirPlay 2 support. To get it working, you need to register your Sonos speakers with Apple’s Home app. The Apple Home app will respect whatever speaker groupings you’ve established in the Sonos app, and you can pin those speaker rooms to your favorites pane if you want. However, once it’s all set up, it’s much easier just to use Siri’s voice support. For instance, you can ask “Siri, play Radiohead on the Sonos Beam” and the music will automatically start streaming. You can be less specific, too, and ask for genres or artists as well. Right now, you can only use Siri to access Apple Music, however. What’s particularly clever is that, if you have a Sonos model with Alexa, Amazon’s assistant and Apple’s assistant can work together – sort of. Music that started streaming from an iOS device via a Siri command can then be paused, or the volume adjusted, or the track skipped forward and back, using Alexa built into the Beam and Sonos One. If you have any other Sonos speaker, and have linked it to a standalone Echo smart speaker using the Sonos skill, you can use Alexa on that in the same way. It’s worth remembering that, unlike asking Alexa on a Sonos One to play Spotify, with Siri the music is streaming via whatever iOS device you made the initial request on. That means, if your iPhone or iPad subsequently leaves the WiFi network, the playback will stop. The solution to that network-exiting problem could well be the HomePod. Apple’s smart speaker supports AirPlay 2, too, and you can ask Siri on the speaker to play music across your Sonos setup. There’s support to link multiple HomePod and multiple Sonos speakers together into a single group, with the audio from Apple Music synchronizing across each of them. Since HomePod has native Apple Music streaming support, if you initiate playback from Siri on the speaker it won’t be affected if you later leave the house with your iPhone in your pocket. And, since AirPlay 2 shows up on each iOS device – including what’s playing and where – you can still take manual control of a HomePod-initiated stream from your iPhone, to control volume and navigate tracks remotely. First, you’ll need an Apple device with AirPlay 2 support. For most that’ll mean an iPhone or an iPad, running iOS 11.4 or later. If you have a HomePod, that should have automatically updated to the latest OS version with AirPlay 2 support back when Apple released it in late May. On the Sonos side, both the controller app and the speakers themselves need updates for AirPlay 2 support. You should be prompted to do that when you next open the controller app on your phone. However, you can also manually check for the update if it’s not showing up yet, by heading into the settings page in the app. It takes a couple of minutes to install, first updating the app on your phone, and then loading the software across each of the speakers in your network. They’ll all need to be plugged into power, of course, and Sonos cautions that things could go awry if you inadvertently unplug them partway through the update. After that, those four speakers with native AirPlay 2 capabilities should automatically show up in the AirPlay menu on your iPhone or other device. You’ll need to use the Sonos app still, to group any other speakers with those four models and spread AirPlay 2 audio around more comprehensively. That’s also how you later change which speakers are being streamed to: AirPlay 2 only sees the four Sonos models with native support, not any older models. If you want Siri support, meanwhile, there’s a final step there. In the Apple Home app, hit the “+” button to add a new device, and then choose “Don’t have a code or can’t scan” from near the bottom of the screen. That should show any compatible Sonos speakers, which you can then add to Apple Home and assign to a room. It’ll be that room and speaker name by which you refer to them when you’re asking Siri to control playback.